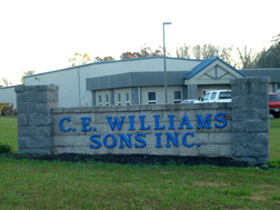 C. E. Williams was started in the early 1940’s by Clyde Williams Sr. when he bought a truck to work on a tunnel construction project for the Pennsylvania Turnpike. It has been a family owned and operated business since then and is now in its’ fourth generation with 35 equipment units and 15 heavy trucks. The first excavation equipment was purchased in the 1950’s and asphalt paving was added in the early 1970’s. When business prospered in the 1980’s the company grew in size and began taking on larger projects. In 1999, the company moved into a new 13,800 s.f. facility on 35 acres at the intersection of Rt. 15 and Rt. 116 east of Gettysburg. This modern facility with office and shop space will help us serve you well into the future. Please contact us with any questions regarding our services or for free estimates. Our office staff is very experienced and committed to customer satisfaction.